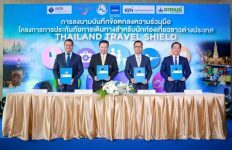 First time in the history of Automotive Tier 1 supplier, Indian and Malaysian-Thai companies are joining hands to forge a strategic partnership to grow their businesses and utilize both companies’ strengths for long-term sustainable growth. 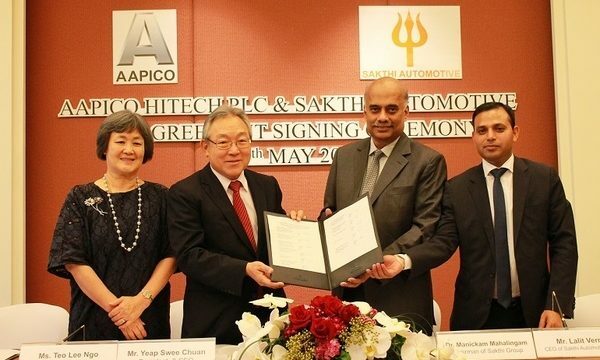 SET-listed Autoparts maker, AAPICO Hitech PLC is investing US$100 Million (B3.5 Billion) into Sakthi Automotive Group to become a substantial shareholding partner and grow the business on global scale by utilizing Sakthi’s global manufacturing footprints. Sakthi has, also, agreed to invest US$50 Million into AAPICO Frame & Forging Business in the near future. SC Yeap (AAPICO Founder & Chairman) and Dr. Manickam Mahalingam (Sakthi Group Chairman) agreed to this partnership. 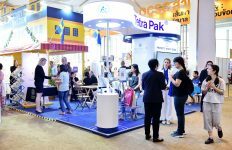 AAPICO is a world-class, largest revenue publicly listed automotive company in Thailand with turnover of US$500 Million. It manufactures Chassis Frames, Press Stamping Parts, Forging & Machined Parts, Plastic Fuel Tanks, Plastic Parts, Fuel & Brake Lines, and Door Latches. 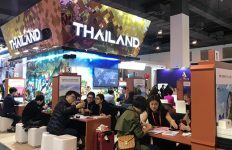 AAPICO key customers include ISUZU, Nissan, Toyota, Mazda, Ford, Honda, General Motors and others in Thailand, SGMW, Chery and Schneider in China, as well as GKN, DANA, in other overseas markets. AAPICO’s vision is to utilize their low cost high quality productive manufacturing skills to expand globally. Sakthi Automotive Group is the world leading supplier for Chassis and Powertrain Safety Critical Components into Iron & Aluminum Castings, with global manufacturing footprints in United States, Mexico (Planned), China, Europe & India. Today, Sakthi Automotive Group has the largest global market share combined for Iron & Aluminum Steering Knuckles Tier 1 supplier for all global OEMs. Its customers include General Motors, Ford Motors, Volkswagen, Suzuki, Hyundai, Toyota, Nissan, Geely, Volvo, Changan, SAIC, Chery, BYD and others. Sakthi has developed their Global Technical Center for Design, Development & Testing facility in Detroit with over 500 employees, which include over 100 returning citizens. “Sakthi Automotive Group is striving to be top 100 Global Supplier by 2020” vision set by Mr. Lalit Verma, CEO of Sakthi Automotive Group. 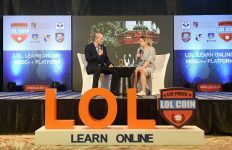 Both companies have agreed that this partnership is going to provide a global platform for AAPICO to develop their Frame & Forging business on a larger scale by utilizing Sakthi’s current facilities in North America, China, India and Europe, in addition to current facilities in Thailand. Total global passenger vehicle production in 2016 was approximately 100 million vehicles and AAPICO current footprint cover only 3 million vehicle production (3% of total market). This investment will give AAPICO access to global vehicle production to grow their business in the future. Sakthi is also going to enjoy the AAPICO relationship with Japanese OEMs to grow their Steering Knuckle business with such OEMs and, also, diversify the product portfolio into Full Chassis Frames and Other Stamping Components along with Forged & Machined parts. This new partnership, between two large family run companies, with long successful automotive history, will hopefully increase revenue significantly in the next 5 years. This will boost the confidence of global OEMs as both companies are producing world quality engineering products and fully focus in automotive business, with over 50 years of combined history. OEMs will enjoy global design, development capabilities with world-class quality product at more competitive Asian/regional manufacturing cost in United States, Mexico, Europe, China, India, South East Asia and South Africa. Currently Sakthi & AAPICO are supported by Automotive and Other Industry veterans among the Board Members and Advisors consisting of Mr. Tony Brown (Retired Ford Motors Company Purchasing & Supply Chain Vice President), Mr. John Calabrese (Retired General Motors, Group Engineering Vice President), Mr. Esam Alnasery (Retired Walmart Vice President), including Mr. John Parker (Retired Ford Asia Pacific President). This leadership provide a long term strategic guidance and support for future growth. When this happens it will be a unique marriage between “Incredible India” & “Amazing Thailand”. This transaction is approved by AAPICO’s and Sakthi’s Board of Directors and closed on 25th May 2017.